Inside: Joint CIA / NSA base. Det. Mishka: You're not FBI. Who are you? Bobby Hobbes: Bureau of Weights and Measures. One problem with being a member of the Government Agency of Fiction or of a Covert Group is that, at some point, you need to interact with the public or non-covert governmental agencies. This is where being a covert group with a mundane front comes in. A covert group has a highly mundane front and it will sometimes be commented that their funding is hidden from the public within the low funding the front group officially receives. Sometimes this will be played for laughs, as characters will either make fun of the official organ the spies are supposed to come from, or else see the front for the Paper-Thin Disguise that it is. As a general note, it is very common for a cultural attaché to be one of these ("travel to interesting places; kill interesting people"). Compare with the low rank/high power of the Almighty Janitor, as well as the Legitimate Businessmen's Social Club, which is when something similar is done by gangsters (and not very well, at that). See also Milkman Conspiracy and Overt Operative. When surrounded by even more secrecy, it becomes a case of No Such Agency. While not required, the Mundane Front may have an Unusually Uninteresting Name, or one with Ominous Mundanity. The spy/assassin November 11 in Darker Than Black is officially supposed to be a minister of some sort. In the second season, two Contractor assassins, Mina and Genma and Kirihara are officially clerks for Japan's Ministry of Internal Affairs and Communications, which is a front for a Black Ops group supposedly fighting against The Syndicate. Given that the actual Ministry is involved in things like managing civil service and telecommunications, this is a perfect example of a "boring" department providing cover for nefarious schemes. In Ghost in the Shell, Section 9 employee Togusa mentions his cover is that of working for a security firm. Maj. Kusanagi on the other hand, maintains that she works for the Military. Ishikawa actually owns a gambling hall for cover. Section 9 usually work in official capacity or undercover, so they rarely need consistent covers. In each of these cases they're not so much 'fronts' as side-projects: Togusa tells his family he's in securities so they won't worry (as much), the Major, mentally, never left the service, and Ishikawa's pachinko parlour is one part of his personal data network, using the elderly players' head-computers to crunch his data (They are WELL compensated through their winnings). The Marduk Institute is a front for SEELE. It's also mentioned that Marduk itself has 108 fronts. Ryoji Kaji, who basically everybody knows is a spy, is officially cited as a "UN attaché" who had guardianship of Asuka. Weiß Kreuz has the four assassins working a cover job as florists, first alongside a little old lady and her cat, and later in a pink mobile trailer. In the sequel series, they're investigating suspicious suicides at prep schools, and go under cover as teachers and students. In Mobile Suit Crossbone Gundam, the Crossbone Vanguard uses the cover of being a civilian freight company, Blackrow Shipping, when not flying under the banner of pirates, allowing them to move around the Earth Sphere without suspicion. Gunslinger Girl's Social Welfare Agency is an Italian government-sponsored institution that helps orphans and aids the rehabilitation of the physically injured with state-of-the-art cybernetic prosthetics. They also have a surveillance and intelligence-gathering division to help deal with the Five Republics terrorists, and some of the orphaned and injured girls they "help" have been transformed by the aforementioned cybernetic prosthetics into cyborg assassins to murder said terrorists. Joker Game has the spies of the D-Agency study and live in an office building labelled the "Greater East Asia Cultural Society." The Adventures of Barry Ween, Boy Genius: The agency that tracks down Barry Ween is the Foliage Census. Their security clearance goes to eleven. The American agency devoted to looking into super-human crimes in the WildStorm universe was the National Park Service, which is actually a real organization. It is mentioned in Moon Knight that a toy store is owned and operated by S.H.I.E.L.D. as a cover. The classic Nick Fury stories had a barber's shop. The chaplains' assistants stationed at Fort Wadsworth, Staten Island in the mid-1980s were always rather wary of those ruffians from the motor pool, blissfully unaware of the Joes' Elaborate Underground Base until Cobra came by to invade it. Issue 3 even dealt with Hawk and Scarlett trying to maintain their cover with the chaplains' assistants, while several Joes in the Pit were trying to stop a captured Cobra robot from escaping to the surface to broadcast their location. The Red Horse Garage, Suicide Slum in some Superman stories was a front for Project Cadmus. Xavier's School For Gifted Youngsters was this for decades. However, it's been blown up so many times, it probably doesn't qualify any more. Scooby Apocalypse has the Athena facility, the Complex's data backup facility, which is hidden within a paper mill. Lampshaded by Shaggy commenting on the oddity of it, with Velma pointing out that they couldn't exactly advertise it as a secret facility. Conversations with a Cryptid: A group of people working for a supervillain dedicated to finding out the dirty secrets that pro-heroes and the government don't want found out. A spy ring? No. A gossip magazine! In the magazine the Heroes Mirror's defense they don't realize they're working for a supervillain. Zach Smith is the head of the Heroes Mirror's Australian branch. His true job is working for All for One running the dark web criminal forum the Conspiracy. Horace and Jasper try this in Disney's 101 Dalmatians, with a briefcase labeled "Electric Co.", although Horace introduces them as being from the gas company before Jasper corrects him. Get Smart CONTROL has its headquarters in the Smithsonian.... in a display about CONTROL. The display pretends CONTROL was disbanded at the end of the Cold War. In fact, many of CONTROL's political rivals claim that it should have been disbanded after its chief rival went defunct. The movie WarGames. In the start of the movie, two air force people walk into a small cabin, in the midst of a snowstorm. They walk up to a normal-looking mirror and show their badges. They are then buzzed into the missile silo entrance and go down to the silo in an elevator. Spies Like Us. The Ace Tomato company. Plus Mission Control for the military's SDI weapon was hidden under a deserted Drive-In Theater. Undercover Brother. The headquarters of the B.R.O.T.H.E.R.H.O.O.D. are located beneath a barber shop. Men in Black. MIB headquarters is hidden in the ventilator building of the Brooklyn-Battery Tunnel. Field agents also claimed to be Division 6 of the Immigration and Naturalization Service. This became a Running Gag in the cartoon where they'd claim they were from Division 6 of whatever organization vaguely applied to the jurisdiction. Which would often result in competent civil servants knowing such a division did not exist.note Important to note, the INS itself no longer exists; it was dissolved post-9/11 and its former duties are now handled by the Dept. of Homeland Security, primarily its Immigration and Customs Enforcement division. The Woody Allen movie Small Time Crooks features a cookie shop set up as a front for a bank robbery attempt. The attempt fails, but the front business becomes wildly successful. Jumpin' Jack Flash. At a funeral for a dead spy it's mentioned that he was in the greeting card business, presumably a Shout-Out to Get Smart. Alternatively, that's what every agent says, so they keep a stash of VDOT stuff to give out. The headquarters of the Bureau for Paranormal Research and Defense in Hellboy is located below a Sanitation Department building. Which also happens to neatly explain the garbage truck they drive around in where Hellboy can easily hide in. The location is even introduced via Gilligan Cut. Director Manning is on television telling the audience that there's no such thing as the B.P.R.D., immediately before the next scene shows the sanitation station with the helpful Title In explaining that it's the organization's headquarters. James Bond occasionally claims to be working for Universal Exports in a few movies. It rarely lasts long. Licence to Kill. The televangelist Professor Joe Butcher actually makes a profit from his preaching, even though it's only meant to be a cover for Franz Sanchez's drug operation. And a henchman working at a marine supply business gives himself away when he doesn't know what the Latin name for a Great White shark is. And finally lampshaded in Quantum of Solace: James Bond mocks Felix Leiter for the CIA's evident inability to do this competently. You know, you should just answer, 'CIA,' Felix. A taxi driver told me where the office was. Played with in Austin Powers - the front organisation Virtucom makes more money legitimately than Dr Evil's criminal plans would bring in. This becomes a running gag, where each new movie would have Number Two suggest they focus on a front organization, which is by far more profitable (Starbucks in the second and a talent agency in the third), only to be dismissed. Dr. Evil: "Why make trillions, when we can make billions?" The bad guys in Under Siege 2: Dark Territory blow up a Chinese "fertiliser plant". Travis Dane: Yeah, I'm gonna shock the world by spreading ca-ca all over the place. Guangzhou is a chemical weapons plant masquerading as a fertiliser plant. We know this. The Chinese know that we know. But we make-believe that we don't know and the Chinese make-believe that they believe that we don't know, but know that we know. Everybody knows. In Charlie Wilson's War, Gust claims to work for Department of Agriculture's Fruit and Plant Division, specializing in apple imports, though it's mostly played as a joke because Joanne is well-aware he's with the CIA. The Wildfire biological research laboratory in the 1971 movie The Andromeda Strain is an underground Defense Department secret facility buried underneath a Department of Agriculture research station. In the film version of Starship Troopers, Carl gets assigned to "Games and Theories" Division, military intelligence. More of an Expospeak Gag, as Game Theory is a central aspect of intelligence work, using mathematical models to predict the behavior of others. The film version of Night Watch has the titular organization's field operatives drive around in a City Light truck and dressed as electricians. The novels written after the film's release mention that City Light used to be a front for the Night Watch. Exploited in Kingsman: The Secret Service. The Kingsmen's classic tailor front is justified by having started out as one, catering to the rich and powerful and becoming quite wealthy and influential themselves in the process. After its owners and clients lost most of their heirs to World War I, they decided to use the un-inherited wealth to forge a new knightly order to ensure peace around the world. It may be the first case where the Covert Group grew out of the Mundane Front practically as a sideline. Kingsman: The Golden Circle gives us Statesman, a (really good) brand of liquor that's the mundane front for the Kingsman's American counterparts. The front is revealed to be a multi-billion dollar company, as one would expect of capitalism; Kingsman sells a few thousand $5000 suits a year, Statesman sells millions of +$100 bottles of liqueur in the same timeframe. In Volunteers, John Reynolds, the Peace Corps supervisor, is actually a member of the CIA working towards getting the bridge built so that American troops can have access to the communists. This is notably artistic license with history, as noted below, the Peace Corps would never be used as a front by any country. The Fraternity in Wanted operates out of a working textile plant. Wesley initially thinks this is merely a front, but it turns out that one of their machines is the Loom of Fate, which gives encoded instruction directing their assassinations. In Sneakers, Cosmo runs the entire financial operations of the mafia (and his Dragon with an Agenda plan to crash the entire world economy) out of a server farm and supercomputer complex that has a completely mundane-seeming front of a toy company called PlayTronics on the outskirts of San Francisco. Robert Redford's character notes that a trained observer can tell the toy company is a front because the building clearly has security far beyond what any toy company would have. In Rudyard Kipling's Kim, Colonel Creighton, the head of the Ethnological Survey of British India, also directs the secret service. There is an overlap between the two organisations; for instance both Creighton and one of his top agents, Hurree Chunder Mookerjee, write and publish legitimate ethnological papers and share the ambition of being admitted to the Royal Society. Apparently this was Truth in Television. Mycroft: It's come to my attention that you are interested in the whereabouts of a certain engineer. Mycroft: Well, I can save you a lot of trouble. My suggestion is that you pursue it no further. It involves the national security. We are handling the matter. Watson: We? Who are we? Mycroft: I didn't say that. Sherlock: I've long suspected some underground connection between this stodgy and seemingly calcified establishment and the foreign offices in Whitehall. Mycroft: That is neither here nor there. Sherlock: Your club is here, there and everywhere! When there are rumblings of revolt in the Sudan an expedition funded by your club conveniently shows up to study the source of the Nile. If there's trouble along the Indian frontier, members pop up in the Himalayas, allegedly looking for the abominable snowman. Mycroft: [chuckles] What a vivid imagination my brother has. In the Aubrey-Maturin series Stephen Maturin is one of Britain's most effective spies, but uses his status as a respected natural philosopher and physician to travel in wartime. In Discworld, The Fifth Elephant has Inigo Skimmer, an assassin posing as a clerk, and a later book, Going Postal references a whole group of "dark clerks", nondescript gentlemen who appear to be ordinary clerks until you meet their eyes. Despite being mostly prize-scholarship graduates of the Guild of Assassins, the majority of their workload is apparently desk-based (Truth in Television for real intelligence agencies), but they're all fully trained for field operations should the need arise. In the James Bond novels, the British Secret Service is based in a large office building with several cover companies, including a radio company to explain all the antennae on the roof. Field agents like 007 are supposed to work for "Universal Export". This was sometimes mentioned in the movies as well. In The Man with the Golden Gun, it is mentioned that the field agents' cover organisation has changed its name to the nebulous-sounding "Transworld Consortium". In Thunderball SPECTRE uses the cover of a refugee aid agency — "Firco" in the novels; "International Brotherhood for the Assistance of Stateless Persons" in the film. In Charles Stross's The Laundry Files series, the supernatural math-magician enforcement/spy agency is fronted as, and always referred to as, "The Laundry", as it was at one time situated above (or behind) a Chinese laundry. Bill the Galactic Hero by Harry Harrison. A frozen-food kosher ham store is literally a 'front' — just a cardboard wall attached to the front of a tank used to ambush the revolutionaries, as Bill finds out when he tries to open the door. The unconvincing cover of a Jewish ham store makes no difference, as it turns out all the 'revolutionaries' are government spies anyway. Michael Kurland uses the Bureau of Weights and Measures as a cover for his two agents in The Whenabouts of Burr. MI-6 fronts as a bank office in the Alex Rider series. Tom Clancy usually has super-paramilitary spy John Clark covering himself as a specialist in a mundane job category. Clear and Present Danger implies that he's also knowledgeable enough to cover himself other ways as well. Debt Of Honor actually has him and his partner pretending to be Russians to infiltrate Japan. When the paramilitary anti-terrorist organization Rainbow is established in Rainbow Six, they're listed as belonging to the Special Air Service in a case of Hiding In Plain Sight. "The Campus," the secret anti-terrorist investigation and assassination squad at the center of his novels starting with The Teeth of the Tiger, operates completely off the government books under the cover of being a financial trading firm. Galaxy of Fear has the Imperial Biological Welfare Division in the Mah Dala Infirmary. Their stated purpose was, well, medicinal and they did serve that purpose to some extent, but really this was a cover for the Imperial Biological Warfare Division, tailoring Synthetic Plagues to test on the population stranded around the infirmary. Teen Super Spy Christopher Cool's agency, the Teen-age Educational Espionage Network headquarters was in a supercar dealership called, originally enough, Luxury Motors. In Geography Club, the characters start a Gay-Straight Alliance at their high school. They call it Geography Club, so that people not in the know will think it seems boring and not want to join. The Riftwar Cycle: Mara's spy network is an exaggeration. Her spies usually run small businesses as their cover, and enough of them turn a profit for the network to be largely self-financing. In Daniel Suarez's Influx, the secretive Bureau of Technology Control has been tasked with suppressing and controlling disruptive technology to make sure rapid change brought about by certain technologies doesn't disrupt world order. Over time they've grown into a hyptertechnological society unto itself complete with paramilitary forces, hereditary citizenship/employment, and at least one superweapon. They're stationed under their old government office building, which is practically abandoned, turning dilapidated, and is filled with technology that hasn't been updated since the 70's. The Avengers: Emma and Steed frequently infiltrate innocent sounding organisations that are a front for (admittedly goofy) dark covert operations. In The Middle Man, the title character and Wendy do this, such as claiming to be from Sanitation in the first episode and climatologists in the second. Rule of Funny is the operating factor, as in another episode, the heavily WASPy Middleman claims he, and Latina Wendy, are Mossad agents. (Then again, Mossad undoubtedly has agents who don't look recognizably Israeli/Jewish...) Also, Wendy's family and friends think she works for the Jolly Fats Weehauken Temp Agency. In fact, even the Middle Men claim not to know who they work for. They just came up with the acronym OTSTK (Organization Too Secret To Know) to use when referring to the organization employing them. The Stargate program has the official cover of "deep-space radar telemetry". When Carter claims she's doing astronomy in an underground bunker, she gets some funny looks. O'Neill or Teal'c claiming likewise elicits outright disbelief. It also serves as a Mythology Gag. In the original movie, they mention using radar to track the end of the wormhole; you can still see the mapping device in the show a few times. UFO. SHADO (Supreme Headquarters Alien Defense Organization) operated under the cover of a film studio. Parodied in the Monty Python's Flying Circus "Mr. Neutron" sketch. The U.S. government had F.E.A.R. (Federal Egg Answering Room) as a front group for F.E.E.B.L.E. (the Free world Extra-Earthly Bodies Location and Extermination centre). The Man From Uncle. U.N.C.L.E. headquarters is located behind Del Floria's Tailor Shop, while another entrance is via The Masque Club. U.N.C.L.E. 's "Section VII: Public Relations and Propaganda" had a charity fundraising group as a front. Wiseguy. "Lifeguard" (Vinnie Terranova's Mission Control) answers the telephone as "Sailor Hardware", run by Vinnie's "Uncle Mike". The eponymous Special Unit uses a dry cleaners for cover. The actual base is located in an abandoned subway station under the dry cleaners. In one episode, a guy tries to rob the place with a handgun. Cue all the undercover cops taking out their oversized guns in a scene reminiscent of RoboCop 3. Lost. The Others recruit Juliet through Mittelos Bioscience. The Pretender: The Centre pretends to be a think-tank as a front for their research and dubious business deals. Get Smart. Maxwell Smart pretends to be in the greeting card business. He also mentions that, to keep his landlord from getting suspicious about all the attempts on his life, he told him he works for the IRS. Max praises the Israeli spy agency "YENTA" for its cover as a delicatessen. It turns out YENTA is a delicatessen that only does spy work in its slack season. The protagonists of the Sci-Fi Channel's The Invisible Man belong to "The Agency", a covert organization that due to defense budget cuts ended up being absorbed by the Department of Fish & Game. In the second season, The Agency ends up being absorbed by several similar unrelated departments, such as the Department Of Indian Affairs, the Department Of Health And Human Services and the United States Postal Service until finally settling in... the Bureau of Weights and Measures. Which becomes awkward in one episode where they go to a physics lab, and the scientists are actually expecting people from BWM to re-calibrate their equipment. On at least one occasion, they are forced to handle cases of their current parent organization, such as when they are sent to a Native American reservation to investigate a murder supposedly committed by Bigfoot while working for the Department of Indian Affairs. As it turns out, not only is Bigfoot real, but it's invisible too and is suffering from Quicksilver madness. When going to the Chinese embassy to rescue their agents, the Official introduces himself as from the Department of Fish & Game. The Chinese assume the second part of the name has to do with the Olympics, causing the Official to describe a different meaning of the word "game", including showing horns with his fingers. Torchwood Three's main entrance is in the back of a Cardiff Tourist Bureau. The team from The Unit use the cover of being in logistics. To be fair, though, they do in fact do logistical work—in fact, one episode begins with Brown being tested in such. Subverted in that the cover is entirely believable; no one ever questions why the obviously badass soldiers are working in logistics, they simply believe, or are told by someone and then believe, that the operators have earned safe, cushy deskjobs after serving multiple tours in the Middle East as part of the regular Army. This cover does falter at times. One episode has the newest recruit SFC Bob Browns young daughter Serena blabbing that my father shoots bad guys. This alarms some senior officials, since the Units cover is a non-combatant clerical unit, forcing Bob and his wife to teach Serena to lie about what he does. Another episode has Unit operator Hector Williams new girlfriends retired Senior NCO dad showing disdain to him due to him officially being a logistics clerk. The guy then suddenly starts being buddy buddy with Hector, upon being subtly informed of his actual job. This sudden change makes the girlfriend a little suspicious. When he admits his cover, she dumps him, because she wanted someone whod leave the Army and settle into a stable civilian job. A logistics clerk has transferable skills, while a gunfighter doesnt. The eponymous artifact-collecting Warehouse from Warehouse 13 was officially operated by the Secret Service, and they get somebody giving them trouble over it about Once an Episode. Reality Is Unrealistic in this case: protecting the President is the most well-known duty of the Secret Service, but they were originally (and still are) the enforcement arm of the US Treasury, among other things. In 2003, the Secret Service was moved from Treasury to Homeland Security, though they still investigate financial crimes and provide security for Treasury. Warehouse 13 itself is out in a remote part of South Dakota, and is officially an IRS warehouse. Good cover, except that everyone in the small town hates the protagonists. Burn Notice: Carla uses one of these as a cover. Michael uses these occasionally, but he prefers private organizations. According to the narration, being in geological fieldwork is a good cover, getting used by multiple people in various episodes. When Michael gets on a semi-friendly relationship with the CIA again, the base of operations is a subsection shared with a more mundane government agency. It's more than just a front or a handy cover ID, as the real reason is simply practical business sense by sharing location costs and having a similar level of security. Doctor Who. In the first episode involving the Jon Pertwee Doctor, it's mentioned that UNIT HQ is pretending to be a branch of the Pensions Dept. A villainous example occurs in Alias with the terrorist group SD-6 masquerading behind the name of a bank, Credit Dauphine. Covert Affairs: As far as anyone outside the CIA knows, Annie works for the Smithsonian, and she often uses this as a cover while traveling abroad. In one episode, her niece's class is supposed to take a field trip to the Smithsonian while Annie is on an overseas mission, and Auggie has to smooth things over by giving them a tour. Chuck: Chuck and Casey's jobs at the Buy More are more or less genuine, but Casey has all sorts of weapons and gadgets hidden around the store, and the ice cream parlor where Sarah works is a front for a secret CIA base. It's not clear if the owners know this; presumably the place is run by the CIA, since Sarah is always away on missions and would probably be fired if it were a real job. Chuck's excuse is that he has to leave the store to answer tech support calls. 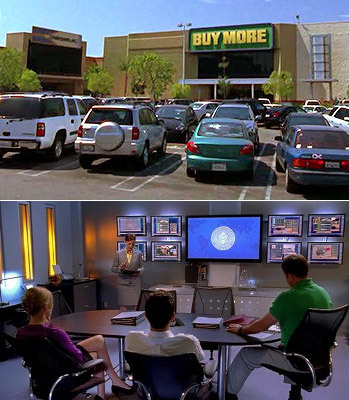 And as of Season 4, the Buy More has been entirely taken over by the CIA and is a full-fledged secret base. However, Morgan convinces General Beckman that people are getting suspicious about how effective the new Buy More staff is, getting her to hire the old, lazy employees back. The store, more or less, goes back to being a regular one after that, albeit with a secret underground base. JAG: In "Impact", The Bradenhurst Corporation officially handles toxic waste near Twenty Nine Palms, CA: but in reality builds UFO-like UAVs for Uncle Sam. In Agent Carter, as far as civilian acquaintances are concerned, Peggy Carter heads to work everyday in the Bell Phone Company, which is a cover for the Strategic Scientific Reserve. In Season 2, she moves to LA, and the SSR office there is disguised as a talent agency. The Company in Heroes uses Primatech, a paper company based in Odessa, Texas. Noah Bennett outwardly seems to be a run-of-the-mill manager there. Buffy the Vampire Slayer. The covert government demon research/fighting organisation known as The Initiative operates beneath a UC Sunnydale fraternity house, with the soldiers posing as lecturers and senior students. A couple of years after this base is shut down Buffy tries to get in contact with them by phone, only to get a flower shop on the other end. She then runs into Initiative soldiers in the ruins of their Elaborate Underground Base, who make it clear they got her message. In The Americans, the Jennings run a travel agency. This provides them with sufficient excuse to travel and to meet different types of people. Delphi in American Horror Story: Coven is an esteemed asset management firm that acts as a front for an ancient line of witchhunters. In Star Trek: Deep Space Nine, the Federation's covert black ops group is known by the benign name 'Section 31' and its agents masquerade as working for any of Starfleet's security divisions. Slightly subverted in that this cover only fools other Federation citizens. The Romulan Tal Shiar is well aware of the agency's real name and purpose...which is exactly what Section 31 wants. It's a long story. Ironically, Section 31 operates as something more akin to a rogue agency than any kind of legitimate intelligence agency, and routinely uses the Federation's legitimate intelligence service (Starfleet Intelligence) as a mundane cover. Star Trek: Enterprise has an organization of temporal agents from the 31st century. Their front man on Enterprise, Daniels, serves as Captain Archer's personal steward because it puts him near the man he was assigned to watch while allowing him to fly under everyone else's radar. In The Flash (2014) Barry and Professor Stein approach Jefferson Jackson about being a candidate for Stein to merge with to become Firestorm. They aren't public officials in any sense but in an attempt to keeps things simple at first Barry claims they are with the "Department of Safety" (which doesn't exist, there is a Department of Public Safety) and Stein has to clumsily add that the department is very new and they don't have a website up yet. The covert agency that employs the titular characters of Scarecrow and Mrs. King is secreted within a film production company, reached through a closet that's actually the agency's front door. Lexx plays this for laughs in Season 4 with the ATF. The Bureau of Alcohol, Tobacco and Firearms exists in Real Life; it is an organization within American Law Enforcement with a focused scope of authority. In the show, the bureau operates vastly beyond this scope. Among other things it negotiates First Contact with the crew of the Lexx, it forcibly maintains the Masquerade, and even President Evil is merely the puppet of its director. In Ghosted to the general public, the Bureau Underground base's of operations in LA is simply the Mid Valley Coat Hanger Company. Hitori no Shita: The Outcast: One of the secret Outsider factions operates using a public front company: Express Delivery, a delivery service. In Nebulous, K.E.N.T. 's cover is that they're a laundry. Much to Professor Nebulous's annoyance, their sponsors in the Government seem more inclined to buy equipment for the laundry than for eco-troubleshooting operations. CORE hides its activities behind a variety of normal businesses, which doubles at their primary budget source. Hunter: The Vigil has Task Force VALKYRIE, the high-priority special ops group that deals with supernatural incursions. Like the Secret Service, they're based out of the Treasury Department. Every single conspiracy in Psionics: The Next Stage in Human Evolution maintains mundane fronts for their psionic super soldiers, who are waging a shadow war right under the noses of the public. Delta Green has the Canadian black-ops anti-occult organzation known as M-EPIC. The EPIC in M-EPIC stands for Environment Policy Impact Comission and it's part of the Department of Environment. The group uses this cover so they can easily secure any rubber stamps from the Parliament without many questions. In Men In Black: Alien Attack at Universal Studios Florida, the MIB headquarters entrance this time around is disguised as a World's Fair pavilion, called "The Universe and You". In Max Payne, the title character infiltrates the Cold Steel Foundry at the start of the third act, a facility which Max notes is "a perfect front for all kinds of illegal activities." It turns out to hide a top secret military bunker called the Deep Six, which is the home of Project Valhalla and Valkyr. In the second game, "Squeaky Cleaners" are a bunch of hitmen serving as the Big Bad's private army. This has a further practical aspect in that the cleaning equipment helps remove bodies, blood and otherwise clean up the aftermath of killings. In Knights of the Old Republic II, the Bumani Exchange Corporation in the space station above Telos is a poorly-concealed front for the Exchange. It's poorly concealed in part because of, and for, being an Open Secret among the station's leadership for when they need a friend in extralegal business; and the Exchange has worked with enough discretion to avoid an investigation by the authorities. RED and BLU in Team Fortress 2 have several of these, and might be considered to be front companies themselves since even though they claim to be demolition and construction companies respectively, they've basically turned into PMCs. In Fallout 3, the player can search the ruins of two corporations, L.O.B. Enterprises and Mama Dolce's, in the post-nuclear war Washington, D.C. and find that they were fronts for Chinese espionage and commando operations before the war. The former was being used to manufacture a pistol that shot incediary rounds and the latter still has Chinese commandos, now ghoulified, using it as a base. In Fallout 4, there's an old secret DIA command center called the Switchboard located in the basement of a Slocum Joe's doughnut shop. The Slocum Joe's corporation itself is a legitimate company, and several other Slocum Joe's franchises can be found elsewhere in the Commonwealth which do not contain any secret government bases. At least, none that the player can find. Grand Theft Auto IV has the United Liberty Paper which is a cover for a unrevealed government agency, headed by a mysterious man wearing horn-rimmed glasses. They apparently are a black-ops organisation judging by the type of assassinations they blackmail Niko into making. Grand Theft Auto V reveals that this organization was a front company for the IAA, a government agency with an Interservice Rivalry with the FIB. The Milkman Conspiracy from Psychonauts uses a cookie-selling girl scout organization for cover. In Vampire: The Masquerade  Bloodlines, the Ventrue prince of Los Angelos rules from a skyscraper named Venture Tower (notice that the name is a misspelling that is still easily recognizable to any newly arrived Kindred who needs to know where the local prince is based,) which hosts a number of high-class banking and corporate offices, all of which serve as a cover for him. In the original Pokémon games, the criminal organization Team Rocket runs the Rocket Game Corner and Viridian City Gym. This is played completely straight in the game, despite Team Rocket having constructed a secret base beneath the casino, through which they must enter. Considering that Team Rocket members wear all-black matching uniforms wherever they go, this may be enough to raise suspicions of corruption or willful blindness on the part of the police. Team Galactic in the fourth-generation games uses the cover of being a research center into alternate forms of energy production. This is a bit more plausible, as despite their nefarious goals, they don't do a whole lot of obvious crime, so mostly they just get funny looks from other people for their uniforms. Team Flare passes themselves off as a fashion cult who are harmless aside from the truly abhorrent amount of money you need to pay to join. Their leader Lysandre never even openly associates with Team Flare and doesn't even run his secret base near the HQ of Lysandre Labs, his legit company, instead having a hidden underground base located elsewhere. Even when they are revealed to be a pokemon abusing terrorist corporation to the world, they just let that label stick for a while so they can focus on their true (and much worse) goals. The secret service player runs in the game Floor 13 is officially a part of the Home Office Department of Agriculture and Fisheries. Way of the Samurai 4 has the Shogunate-aligned "Black Mask" covert ops/assassination group. Their front? The Toasty Truth Bar, which is also ironically the favorite haunt of the anti-government rebels Disciples of Prajna. In fact, one of the finer plot points is to discover that you've been fed false information if you play the Prajna route. In Tropico, in order to make the Secret Police building, you just have to designate an already built structure (bar, restaurant, theater, etc), then it will be converted into the agents' base of operations. Their job description includes lots of wiretapping, preventing assassinations and swearing all the time that the place is not the Secret Police HQ. Season 2 of Batman: The Telltale Series features a sinister rogue government conspiracy who have their secret base hidden in a spa. Give them points for trying; Bruce enters to scope the place out and the dangerous operatives start telling him about the massages they have on offer. The Order of Denderah in lonelygirl15 uses the Hymn of One, Verdus Phamaceuticals, the Wyman Foundation, the Lullaby Project, Bio-Therapy Report LLC and Sacred Spirit. In KateModern, the Order's covers are the Hymn of One and St. Grinstead Psychiatric Research Institution note Absolutely no relation to Scientology, which has its UK headquarters in the town of East Grinstead. The SCP Foundation has several front organizations including the Soap from Corpses Products inc. In the Global Guardians PBEM Universe, the various special agents who make up the Damocles Directive all belong to the Federal Healthy Homes and Lead Hazard Control Office. And yes, that's a real-world government agency. In Alice Isn't Dead, the Narrator now works as a long haul truck driver for Bay & Creek Shipping, to Exploit the job's mobility in her search for her missing wife Alice. That company, in particular, featured heavily in Alice's scattered documentation of The Conspiracy she'd been investigating shortly before her disappearance. According to the Narrator's alternately wry or bored audio diaries, it hauls thoroughly mundane cargo like travel-sized deodorant and paper products. Archer The ISIS building literally has a Laundromat as a front for their office building, with the elevator to the office hidden in behind some industrial washing machines. It get's converted into a bar when the agency hits hard times. In the Men in Black cartoon, the agents are officially working for the Department of Weights And Measures. The cover they give always takes the form: "<Situationally-Appropriate Government Agency>, Division Six", so they've been hotel inspectors, immigration, coast guard, and a host of others. Ben 10: Ben's grandad belongs to the Plumbers, an MIB-like organization. In the latter series, it's revealed they're basically the Galactic Police, with every government on Earth respecting their authority in situations involving aliens. Lampooned in The Simpsons, with intelligence agency vans disguised as "Two Guys From Quantico Pizza" and "Flowers By Irene". In another episode it is revealed that Major League Baseball is actually a secret organisation that spies on Americans using everything from satellites to miniature cameras hidden in baseball bats. In Avatar: The Last Airbender, the secret police force of the Earth Kingdom capital, the Dai Li, is officially known as the Ministry of Cultural Heritage Preservation. In Max Steel, the spy agency N-Tek's building manufactures and sells sports equipment. Sheep in the Big City: In "Going off the Sheep End", General Specific and his soldiers disguise their so-called "Top Secret Military Base" as a bakery. They accomplish this by doing nothing more than covering up the "-se" on their sign with "-kery". Justice League: Lex Luthor has a secret bunker ironically located underneath a barbershop. Completely averted in the case of real-life MI-6, whose headquarters is a very nice building on the river Thames that is actually listed in guidebooks as the headquarters of British Intelligence. However, if you ask the front desk, they will insist that they are simply part of the Foreign and Commonwealth Office. Which they are, incidentally. Contrary to certain media, most Intelligence Officers ("spies" work for the enemy) take advantage of diplomatic immunity by officially being the "Assistant Press Attache" or a similar non-job in an embassy. They'll usually be operating under their real name, too; "cover" doesn't so much mean lying about who you are than lying about what you do (especially these days, when not appearing on Google, Facebook, etc. can seem really odd and raise red flags—best to lie about as little as possible). The largest problem of such a system is that if the embassy is closed, so too are most of the spies in the country. Three quarters of the people in Soviet embassies were spies  with every single one in the military section being a GRU officer, and most of the remaining quarter working for KGB in their free time. The sole exception to the above was often the Military Attache himself, who was often an older man, not always in perfect sound mind, but with a chestful of medals won in World War II. He literally did nothing  not secret, not open  except participate in memorial ceremonies. One of the Soviet military attaches in Canada in The '80s didn't even bother with that; he acted like his posting was a never-ending vacation. The scuttlebutt of the time was that he had something on someone, and given his standing and great age, maybe he did. Just before World War II, British intelligence used passport control officers as spies as it was a position that generally wasn't very busy. Given what was occurring in Europe at the time, there was suddenly an influx of people wanting to emigrate from Germany at the exact same time that their services as intelligence gatherers was needed the most. As a result they created a second one of these, the Z organization: a network of business contacts throughout Europe that would operate independently of the embassy system. A CIA officer's cover (whether working abroad or at headquarters) might be (theoretically) assigned not only to the usual suspects (Department of State, Defense, Homeland Security) but also some weirder ones (e.g. Department of Agriculture, Department of Commerce, and yes, perhaps even the Bureau of Weights and Measures), as well as private US corporations (not naming names) that have agreed to let the CIA use them for cover. Similarly, an SIS officer might easily be assigned to a quango with business abroad (the British Council in any country is notorious for being riddled with spies—probably even more so than even the British Embassy) or at home (if working at Vauxhall Cross). During the Vietnam War, the CIA ran a charter airline, Air America, to support covert CIA operations all over Southeast Asia. One of the few exceptions: You will never, ever find a CIA officer under Peace Corps cover. Ever. That would detract from the legitimacy of the Peace Corps (goes the argument), and so if you want to serve in both the Peace Corps and the CIA, you have to do your two years at the Peace Corps, wait five whole years, and then you can apply. Applications to join the CIA take at least six months to process. The only reason many countries allow the Peace Corps in is because they're emphatically not a CIA front. Ever. If they tried it and got caught, it would mean the Peace Corps would be pulled from those countries, the US would take a terrible diplomatic blow, and a bunch of innocent, skilled, and altruistic people would get hurt, arrested, and/or killed. It's just not worth it, especially when there are much more discreet alternatives. Israel's (only known) nuclear plant is officially a textile factory, although it's reached the point where, after the disguise stopped working in the seventies, they don't even cover it up any more. Subverted when the United States bombed a Sudanese pharmaceutical factory in 1999 that turned out to be ... a completely innocuous pharmaceutical factory. The US Secret Service used to be this way. They were originally part of the United States Department of the Treasury and tasked with tracking and catching counterfeit currency. Then in 1901 the Treasury agents were given the job of protecting the President of the United States and a long list of other people in reaction to the assassination of William McKinley, which is the public image of the Secret Service these days. Since 2003 they've been shifted over to the Department of Homeland Security, so the trope no longer applies, although the job of chasing counterfeiters is still within their jurisdiction. At that time, it was one of only two civilian federal law-enforcement agencies, the other being the US Marshals. The Marshals, however, were tightly linked to the judiciary; though they are part of the Department of Justice (and therefore formally ultimately take orders from the President), their job revolves around the courts: guarding courtrooms and courthouses, enforcing judgments, serving process, that sort of thing. If it didn't more or less directly involve litigation, the Marshals were generally not inclined to get involved if they could help it. On the other hand, the Treasury Department had for many years routinely loaned out Secret Service agents to other federal departments for investigative tasks, the agency was really the most obvious choice. Some 9/11 conspiracy theorists claim that the NIST evaluation of and whitepaper about the WTC 7 collapse was doctored by the government to obscure the evidence of explosives/thermite/nanothermite/whatever Unobtanium the theorists think was used this week. NIST is the National Institute of Standards and Technology. Their domain literally involves weights and measures. India's main secret intelligence agency has the innocuous-sounding title "Research and Analysis Wing." The US atomic bomb program began within the Bureau of Standards (predecessor of the aforementioned NIST). After it was transferred to the Army's Corps of Engineers, it was renamed the "Manhattan District", following the form of the Corps' many civil engineering divisions. The British Army's Special Air Service is believed to have a long-standing secret arrangement with British Airways. If the SAS wants to discreetly move uninspected cargo on BA planes anywhere in the world, or even parachute troops from cargo flights just slightly off their normal routes, the pilots and crews won't ask questions. An increasing number of secretive, tier-one US military special operations units are using innocuous or obscure names. The Navy SEAL counter-terrorist unit formerly known as SEAL Team Six (the one that killed Osama bin Laden) changed its name to "Naval Special Warfare Development Group" (DEVGRU) in 1987, and supposedly is operating under a different, classified name now. 1st Special Forces Operational Detachment-Delta (1st SFOD-D), more popularly known as "Delta Force," has gone through a few name changes and is now "Army Compartmentalized Elements" (ACE). The folks who collect all the field intelligence these kinds of groups need before they conduct a mission is an Army unit simply called "Intelligence Support Activity," or "The Activity." Name of one of the, if not the, best special force units? Special Air Service , which if not for its fame would sound more like a delivery company name or a military unit that serviced aircraft. David Stirling, one of the founders of the SAS, also founded a television distribution company in Africa, Television International Enterprises, to not only serve as a means to keep spreading British culture (they were the African distributor of Doctor Who) but also as cover for a mercenary company. When anti-capitalist groups staged protests in London in the 1980s, hoping to disrupt the operations of the Stock Exchange, their attempts failed because much of the actual work of transferring and registering stocks and shares took place in anonymous offices in side streets. The Indian Navys special forces the MARCOS (Marine Commandos) officially are designated as either submarine crewmen or salvage divers. Official policy is that even their families must be kept in the dark.